So what are some of the secrets to throwing a good barbecue? When I throw a barbecue, there are a lot of components to it, and one is getting as much done ahead of time as I can. So I'm cooking two hours ahead of time. Poach your sausage, peppers and onions beer or tomato sauce, so when your guests get there, you're not stuck at the grill forever. You can just toss them on for a little while. Do as much as you can ahead of time -- salads, appetizers -- and get yourself involved in the party. And marinate your meats. That way you don't have to worry so much about the cooking temperature. Marinating them will keep them from drying out if it's too hot. Keep meats the same size so you're not worried about timing. If you have chicken, I plan for at least 45 minutes ahead for chicken on the bone. The easier you make your life the more your guests will enjoy the party. If you're stressed, they'll feed off your stress. What are some good appetizers you can do early? Some fun things for appetizers: Char up some avocado and make a guacamole. It will have that charred barbecue flavor. Same thing with salsa or bruschetta. Char up your peppers and onions -- get those out of the way and when your guests come try to do stuff where you're not spending lot of time on the grill. What about main course stuff? I do bone in chicken. Here's a way to do that ahead of time: [spice] rub it, set it on the grill, cook it till done. Then wrap it in aluminum foil or regular foil and put it in a cooler. Just a regular cooler. You can do quarter chickens and just wrap them and throw them in a cooler and it keeps the heat in there for hours. If a guest shows up late, you just take it out and it's ready -- piping hot and juicy. I also make sure I have hot dogs around because no matter how simple or complex things get, if you've got kids coming, they always want hot dogs. You can also do grilled cheese on the barbecue. Keep your vegetarian friends in mind -- grill some portobellos. You can also do pizza on the grill. Grill up some veggies ahead of time for toppings. For pizza, the trick is oil your grill grates and have your dough rolled out ahead to personal sizes. Throw your dough on the grill -- it will cook very quick on one side. Flip the cooked side over and put toppings on other side. There's a little art to it ... but it's not too tricky at all after you do it a couple of times. It's a good idea to have a cooler spot on the grill in case the bottom of your pizza gets a little too charred. It's always good when you're grilling to have a spot with direct heat and a spot with indirect heat -- so if things get out of hand you've got somewhere to move the food. Or if you have a bunch of guests come in and you have to walk away from the grill. That's important to remember. I'm a big meat fan and I get everything done and look around and there's just piles of meat. We do a a corn salad at Nighthawk's that's really popular. Just grill corn on the cob until it's a little caramelized and has a nice char. Then take it off the cob and toss it with feta cheese, basil, thyme, cherry tomatoes and salt, pepper and olive oil . We get more requests for that at the market then anything. The corn gets a little sweet -- like candy. If you do a potato salad, maybe grill your potatoes -- grill as much as possible. If you want to grill your corn and potatoes earlier in the day, you can. If a salad has cheese in it, don't add that until the day or it could get mushy. You can always add a little olive oil to loosen a mayo-based salad if you did it the night before. You can do the salsa or guacamole ahead of time and the day of hit it with a little lime to bring out the flavor just before serving. What's a good barbecue dessert? Lots of different fruits are great on the grill. Just sprinkle them with a little cinnamon sugar and grill. You can do banana splits. Just grill a banana a bit and put it in an ice cream dish. You could even do peanuts and roast theme on the grill. I always have aluminum foil around when I'm barbecuing. You can use it as a pan or you can make a pouch. I make pouches and put peanuts in the pouch. You could candy them -- throw some sugar and cayenne pepper on them and use those as a topping for your ice cream. What's your favorite barbeque food? I really love a good strip steak on the grill. Just salt and black pepper, medium rare. OK, important question here: Charcoal or propane? I totally understand and appreciate the convenience of propane, and it's definitely got its place, but you can't get the same flavor that you can with charcoal. Especially with steak or barbecued chicken. You can't get that smoky flavor anywhere else. Christian Noe is the proprietor of Nighthawk's Kitchen, which is at the Troy Farmers' Market every week. 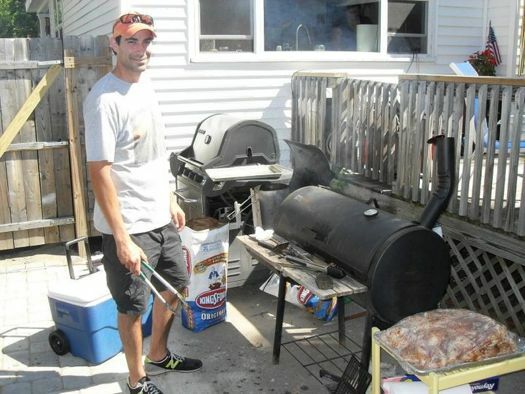 His class at the Arts Center on grilling and homemade sausage is coming up August 20. "Barbecue is an ancient form of cooking that involved low and slow cooking temperatures and smoke"
If you ain't smokin' it, it's just grillin. Christian, you are invited to my house to barbecue anytime. The chicken-in-a-cooler thing? Such a simple and good idea! Glad to see people advocating for grilling the corn directly over the coals. I'm always running into people who are skeptical of this, they want to grill in the husks or wrap it in tinfoil. I mean, at that point you're pretty much just steaming it and might as well do it in the microwave. For my money the only way is to grill it over direct heat and let it get a little charred; it'll be crispy and oh so sweet. Food sounds great. The corn salad is definitely something I'll try. On the downer side... seeing as we've had multiple houses burn down in albany/troy this year due to ashes/sparks from grills on wooden decks... might want to consider moving that awesome smoker away from your wooden deck.